The Unli50 or Unli Surf promo of talk n text will boost a whole day of unlimited internet connection. Using your internet enabled mobile phone or smartphones, you can enjoy a whole day of entertainment and fun without thinking about bandwidth limit and capping. You can also use a USB dongle (USB broadband) to surf using your tablet, laptops, and PC using SMART Bro wireless broadband, since TNT SIM can be used on such broadband. 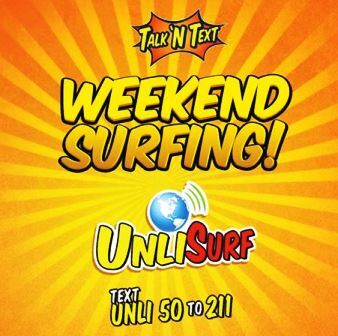 The unlimited internet promo can be used to any Talk n Text SIM card. Maintain 1 peso load to continue using the service. Available in all areas in the Philippines.